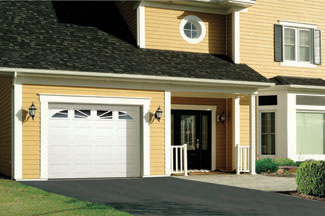 We are proud to offer the Garaga garage door that is available in 139 models and multiple colors. The Garaga door models are available with insulation factors from R‑12 to R‑16 and in various thicknesses from 1 ⅜ to 1 ¾ inches. We carry an aluminum model that is 2 inches thick. The Garaga overhead door can be fitted with windows to provide natural light. Another great feature of the Garaga door is the many varieties of décor hardware that is available to further enhance this doors appearance. 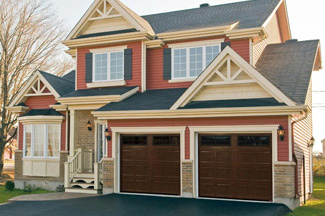 You can even use the online garage door builder and visualise your future door on your home. Another unique feature of the Garaga door is the inter-locking panel design that will keep the harsh weather from entering your garage. This door is silent because it uses nylon rollers. The durability of this door in unequalled and its energy efficiency is the best on the market. The appearance of your home will be remarkably changed by a Garaga door with any one of the many varieties of décor hardware. The Garaga door has a lifetime warranty which demonstrates Garaga’s confidence in their product. Garaga also manufactures commercial, industrial, and agricultural overhead doors. We sell the LiftMaster by Chamberlain garage door openers to accommodate every door. The LiftMaster openers are available with one or two lights, and either belt or chain drive mechanisms. We have the proper horsepower rating for the weight and size of your new door. The LiftMaster motors carry a lifetime warranty. We also sell the LiftMaster opener which is ideal for garages that do not have the headroom for a traditional opener. We are proud of the professionalism and experience of our installers. They will make sure that the torsion spring is installed properly, and that all moving parts are operating efficiently. 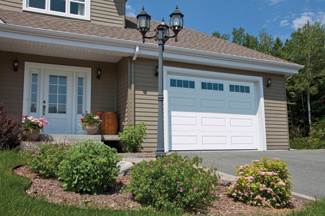 We specialize in garage door repair in Bloomington, but also garage door installation, maintenance and sales when homeowners experience a problem with the door’s operation.We also provide a routine maintenance check-up that includes inspection and lubrication of all moving parts, proper alignment of the tracks, and all door hardware. We make sure that the torsion spring that is the most dangerous part of the door mechanism is balanced properly. You can stop looking, Gutwein Quality Doors, Inc is the expert you need for your Bloomington garage door repair, services and sales. Call us now at 815-657-8173 or send us an email for all your garage door needs in Bloomington, IL.